Everyone is welcome to visit, pray, and worship at our parish. You do not need to be of Greek descent nor do you need to speak Greek to be a part of and enjoy our community. Sacramental participation is only for Christians who have been baptized and/or chrismated in the Orthodox Church. If you have any questions or if you are interested in conversion, please contact the priest. Depending on the reason for your visit, we have a variety of opportunities available for people who are interested in learning about the Orthodox Church. For those interested in just attending a service we provide basic information below. If you are interested in learning more about Orthodoxy, please join us for religious education class, Orthodoxy 101. 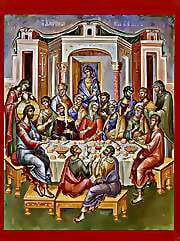 Matins: Sundays at 9:00 A.M.
Liturgy: Sundays at 10:00 A.M.
Tuesdays: 9:00AM - 4:00 P.M. It is customary to show respect in holy places by dressing formally. Usually a shirt, tie, and nice trousers for men. Women can wear dress pants or dresses. Avoid revealing clothing. Also avoid overly casual clothing like jeans, t-shirts, and tennis shoes. See our link on the contact page.